Visualize, compare and investigate transaction patterns with TranxTracker, the user-friendly custom reporting kit for QuickBooks ® users. 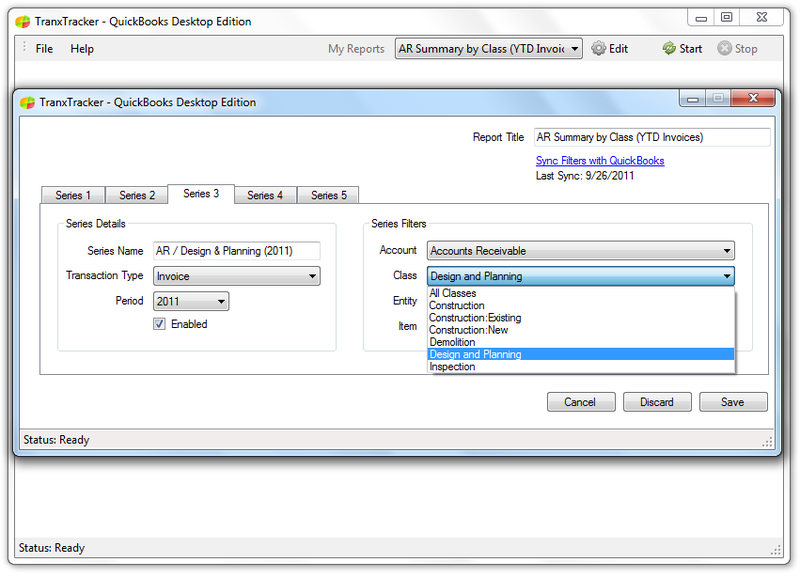 Assemble, run and rerun any number of custom reports. Reports are automatically archived and always reflect current QuickBooks ® data. Track and compare different customers, items, classes and more. Run advanced, comparative reports in minutes (no over-night synchs). 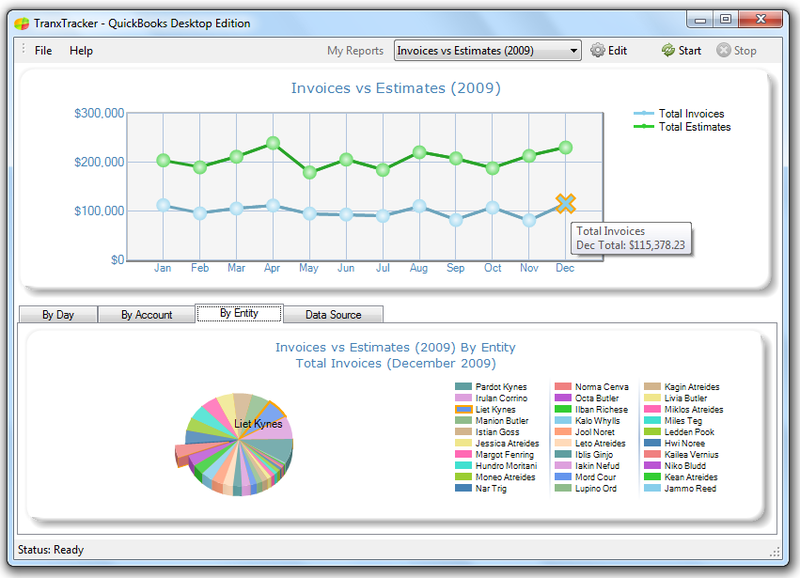 Visualize transaction patterns and relationships with TranxTracker, a fast and user-friendly graphical analysis solution for QuickBooks ® users. Render detailed visual reports in minutes without field mapping or over-night synchronization. Monitor and compare performance patterns involving any transaction type, item, class, entity or account. Instantly visualize volatility, seasonality, growth and decline over time. Traditional reports, ratios and spreadsheets are ideal for assessing performance at a single point in time but often fail to uncover underlying relationships. TranxTracker is specifically designed to help you analyze performance patterns and relationships between different items (products), entities, classes and accounts spanning a wide range of transactions used by QuickBooks ®. TranxTracker lets you decide what to analyze, queries QuickBooks ® for the exact detail required and renders results in an interactive analysis environment. 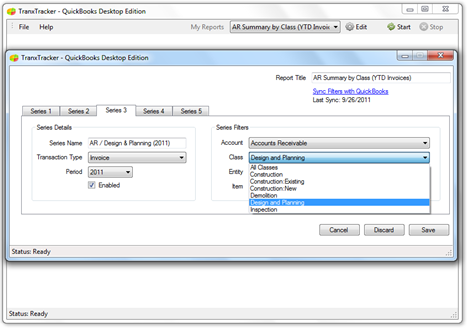 Custom reports are automatically saved for future use, run in minutes and always reflect up-to-date data. TranxTracker installs in minutes and includes a straightforward walkthrough which will help you connect with QuickBooks ® and begin building custom reports. There's no limit to how long you can evaluate TranxTracker, but reports run during evaluation omit a percentage of detail. You can later unlock full detail for your reports by purchasing a user's license. To get started, click the Download button below. Once complete, unzip the downloaded folder and run Setup. Your download is ready! If the download dialog did not display, please click here to start your download. To purchase a user's license for TranxTracker, just click the checkout button below. Following your secure checkout, Google will email you with a purchase confirmation and a License Key which you can use to immediately unlock TranxTracker's full functionality. Money Back Guarantee: If you are for any reason unsatisfied with your purchase, let us know within 30 days for a full refund. Existing Users: To update versions simply download the latest release, run Setup and enter your license key when prompted. Your custom report list will not be overwritten when installing the updated version. Updated primary interface; user-defined reports now saved for future use. 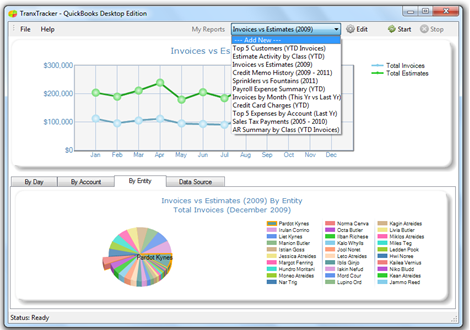 Added support for additional QuickBooks ® transaction types. Rewired filter mechanism to hasten query times. 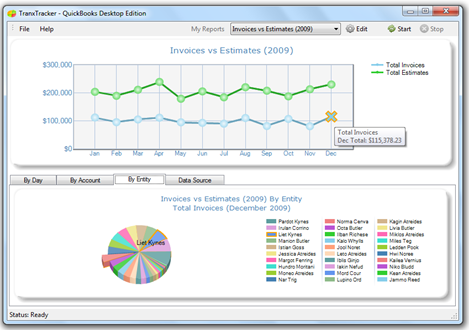 Fixed connection bug specific to QuickBooks ® releases 2006 and earlier. Removed Company File path specification; now connects to currently open Company File. Fixed installation bug specific to VirtualBox and Parallels deployment. Fixed installation bug specific to Windows 7 (64 bit). Updated to latest QuickBooks ® Foundation Class (10.0).